The XGA Resolution Sharp PG-D2500X DLP Projector is a powerful and versatile beamer that can light up a screen with 2500 lumens at an 1100:1 contrast ratio so it works well in venues with a fair amount of ambient light. The pictures it beams are vivid and saturated courtesy of Texas Instruments BrilliantColor DLP DMD imaging chip (that’s the part that forms the image). TI’s digital light processor chips are regarded as the best projector engines available by many videophiles. Once you’ve used the PG-D2500X we think you’ll agree. The DMD part of the name stands for Digital Micromirror Device. There are millions of microscopic mirrors in the chip that operate so fast that they can project one image for each eye, making 3-D in your home, school and office a reality. You bring the 3-D glasses and programming. Your projector is ready to bring you everything from fantastic scientific visualizations to stunning 3-D movies. You’ll find the PG-D2500X works almost everywhere. It’s NTSC, PAL and SECAM compatible; it’s got a 17 language on-screen display (OSD) and a power supply that can handle 100 – 240 V AC, at 50/60 Hz. It even works with several PC and Macintosh resolutions. And to make sure you reach your entire audience the PG-D2500X decodes and displays closed-captioning information from programming that provides it, benefiting those in your audience with hearing impairment and those learning English as a second language. It helps everyone understand difficult dialog or when presenting in a noisy environment. The PG-D2500X produces a bright 2500 ANSI Lumens and has a contrast ratio of 1100:1. So your presentations will be impressive even in a bright room. Texas Instrument’s BrilliantColor technology increases color accuracy while it increases color brightness by up to 50 percent over DLP projectors without it. BrilliantColor provides accurate, true-to-life images because in addition to red green and blue, its spectrum includes their complements: cyan, magenta and yellow. 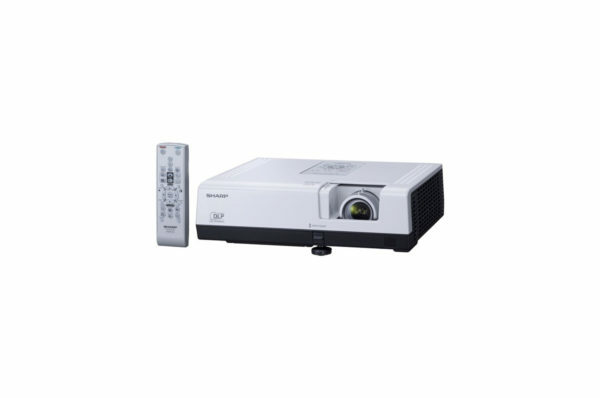 What’s more, DLP projectors require no filters that have to be periodically cleaned and replaced, saving you time, money and in a permanent installation, possibly some skinned knuckles. If you’ve seen a recent 3-D film in a movie theater, chances are the 3-D effect was generated by a DLP Cinema projector. That same, basic technology has been applied to the PG-D2500X. DLP technology uses millions of Digital Micromirror Devices (DMDs) that reflect light to create a stunning picture. This imaging technology is so fast, it can actually produce two images on the screen at virtually the same time: One for the left eye and one for the right eye. Then 3-D glasses combine the two images to create an amazing 3-D effect. This projector is ready for the revolution. All you need to add is 3-D glasses and 3-D programming that can include lessons developed for 3-D, 3-D games and 3-D movies. This projector can process computer RGB signals at UXGA, SXGA+ ,SXGA, WXGA, XGA, SVGA on the PC and Mac 21″, 19″, 16″ and 13″, using intelligent compression for resolutions above its native XGA. The remote control’s capabilities include 3D Mode on/off, page up/down, GUI (Graphic User Interface) pointer, spotlight and mouse control. The pointer function offers a choice of five on-screen icons; The spotlight function highlights a box or row of information. This feature helps protect the lens from dust and it provides an instant lens shutter. In the event the lens cover is kept closed for more than 30 minutes, the Auto Power-Off function automatically turns the projector off. On the lamp housing there’s a shutter door that helps keep glass confined if the lamp breaks. The PG-D2500X’s security features include a LAN monitor function, a reinforced metal security bar, Kensington lock compatibility and an optional security cable kit (for use with the optional ceiling mount bracket). Also available is the free downloadable Sharp Display Manager software for multiple projector management and monitoring for theft prevention. 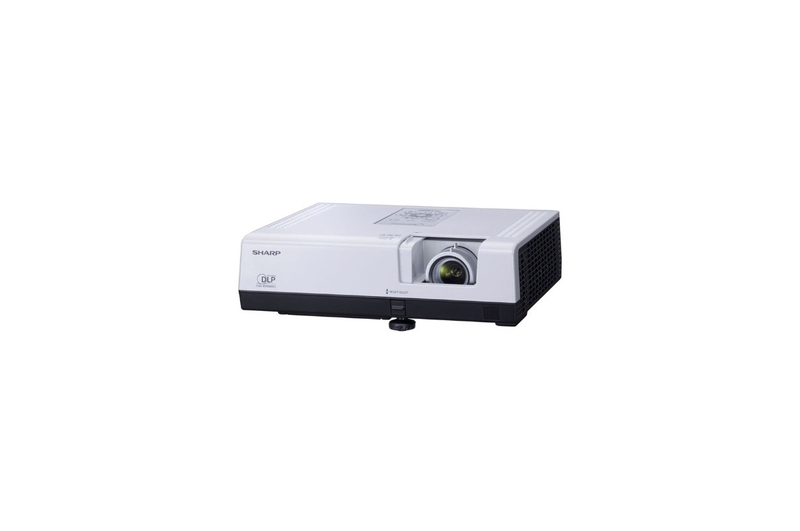 This projector can display CC channels CC1 and CC2 from program sources that provide CC. That’s good not only for your hard of hearing audience members but for anyone learning English as a second language or when you have to present in a noisy environment.